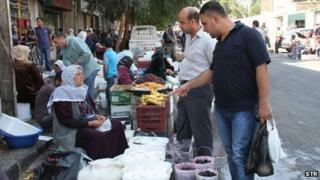 As the Syrian crisis continues to unfold, people living in Damascus share their everyday experiences. They will continue to update us on life in the Syrian capital on a regular basis. My name is Yasmin. I'm in my 30s and a resident in Damascus. I'm not entirely sure if I'm the one residing in Damascus or if the city is residing in me. I work in the private sector, which hasn't been doing well from the very start of the revolution. The downturn has hit us all in various ways. I come from a middle-income family, I am the eldest sister of siblings and I'm unmarried. I belong to the Alawite sect which does not represent me at all when it comes to my political point of view. I love life and I'm still hopeful because it is the only thing that holds us together now. I have hobbies - which almost came to a complete halt when the crisis began - including sculpting and swimming. Even reading has become a luxury as the general atmosphere has affected every aspect of our lives. And even if we were to ignore the current events, the sound of an explosion or a power cut comes to remind you that you're here in Damascus still breathing in the bullets and death on a daily basis. My family decided to leave for our ancestral village and live there. Personally, I could not leave my work and soul in Damascus. I have relatives abroad and I have dual nationality, however I refuse to leave Damascus. I feel like it would be betraying my love. I could not participate in the revolution as much as I would have liked. But my will to continue life here despite the difficulties makes me feel I still belong to the revolution. It is simply my homeland. I'll continue to tell the story of Damascus. How its streets came to be ripped apart, its homes destroyed, its people displaced and detained until the dream was checked. I'm Safaa and I'm nicknamed Umm Ja'afar. I am 36 years old and my eldest son is called Ja'afar. I have another boy and a girl. I was born in Damascus, although my family is originally from the coastal city of Latakia. I'm a public sector employee. Since the start of the crisis, and even now, I can I say I live my life normally. I still carry on going to work despite the fact that my workplace is sometimes exposed to mortar fire from armed groups as well as terrorist bombings. But my situation is that of every Syrian and my motto can be summarised by the Koranic verse: "Say nothing will happen to us except what Allah has decreed for us." We are still carrying on with our lives and work as a way to support the state against a possible strike. We have not run away and we will not run away. We are steadfast. On Saturday, I participated in a human shield sit-in, on Mount Qasion overlooking Damascus against the possible strikes organised under the slogan: "With our bodies in the way, you won't." As for me, I will remain the mother, the activist and the employee. Our country has given us a lot and it's time to return the favour. I will be updating you regularly from Damascus with what's happening my life and I hope to be not too heavy on your hearts whilst you read my words. I hope also that you will be able to feel my sincerity and truth of my words. I know that my words may not appeal to some. I'm used to people attacking my point of views as my Facebook page receives attacks from anti-government supporters who are always trying to convince me to join them or water down my writings.